In case it isn’t obvious, Escape Hull is part of the nationwide Escape chain. The brand has a few standard rooms, five of which are present here (Contagion, 221B Baker Street, Witchcraft and Wizardry, and Taken), but they occasionally make games that are specific to a location. The Darker Side of Hull is, unsurprisingly, one of those. As luck would have it, I’ve played all the other ones in that venue, so this was just a flying visit to tick off the final room. The venue has a bright and breezy reception area, with high ceilings that give it a real feeling of spaciousness (aside: I peeked into the Witchcraft and Wizardry room, and they’ve put those high ceilings to great use in creating a very pretty set). The flip side of having so many games is that it did feel like there were a lot of teams coming and going through that central space, so it isn’t the cosiest waiting area if you turn up a bit early and have to hang around. You are usually more than happy to take the night shift at Hull’s History Museum but after the disappearance of your colleague it’s certainly not where you want to be. 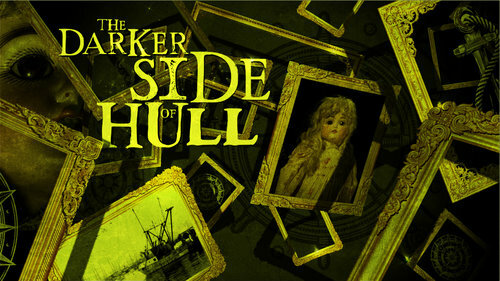 Delve deep into the museum to find out what happened to your colleague but be careful, you may discover more about Hull’s dark past than you wanted to. The game starts with your team being split into two groups, with the initial task of getting back together. There didn’t seem to be anything in the storyline to explain why that was the case, although it’s a fun mechanic that I was happy to go along with. Communication puzzles obviously abound in that situation, and simple puzzles are made more enjoyable by requiring collaboration. The communication involved should take place over walkie-talkies, although the walls are so thin that we had to keep reminding ourselves to play properly. That opening sequence worked reasonably well until the final puzzle that was meant to reunite us. The problem was that it was lopsided in favour of the other half of our team: we had to do almost nothing while they took on the taskwork. The result was that we were left waiting for what felt like an age while they opened the final lock to reunite us. It also meant that, once we entered the next space, they’d already had time to explore it, which left me with the (possibly incorrect) feeling that they were one step ahead in terms of searching/puzzling. Fortunately, it’s visually quite an appealing game, with a nice rendition of a gallery in a local museum. That made being the third and fourth people to investigate the space a little more interesting. When you’re deprived of the quick wins that a typical search might turn up, having something interesting to look through is a good alternative. In terms of puzzles, the game started off with somewhat simple tropes – which is perhaps reasonable as a way of teaching new players – but, as the game progressed, so did the quality of the puzzles. As with most Escape-designed games, there was a tendency towards linearity although, unusually, there was some parallelisation right at the end. They made nice use of the theming to produce one original two-part puzzle and another which, while fairly standard, was very cleverly designed to minimise brute-forcing. I suspect most players won’t even realise the effort they have gone to, so kudos to them for that! As the game progressed, there was a particular style of puzzle that was repeated a little too often for my liking. Arguably, the slightly more “cultural” nature of this room made that acceptable but, even allowing for that, I still felt it slightly outstayed its welcome. We escaped in around half an hour with one clue to point us in the right direction. In spite of first impressions, this was a pretty game with a reasonable flow of logical puzzles. It’s not going to knock your socks off but, if you want a game that showcases some of the history of the city, is generally pleasant to be in and serves up a decent set of puzzles, then I think it’s a good option. We played with four people, which felt like a reasonably sized team for this game. I might have recommended just three enthusiasts but, with a split start, I think two pairs is just right.